Compressive knit knee sleeve with medial/lateral support and patella stabilization. Combining patella stabilization, medial/lateral support and compression, get the protection and treatment your knee needs whether you're suffering from patellofemoral syndrome, a knee sprain or soreness. The DonJoy Performance Deluxe Knit Knee Sleeve With Stays helps reduce knee pain and swelling without restricting your range of motion. Designed as a slip-on, low-profile sleeve, the Deluxe Knit Knee Sleeve With Stays can be worn comfortably on or off the field and discreetly under clothing. The DonJoy Performance Deluxe Knit Knee With Stays is a low-profile, compression knee brace support that helps ease knee pain and swelling. 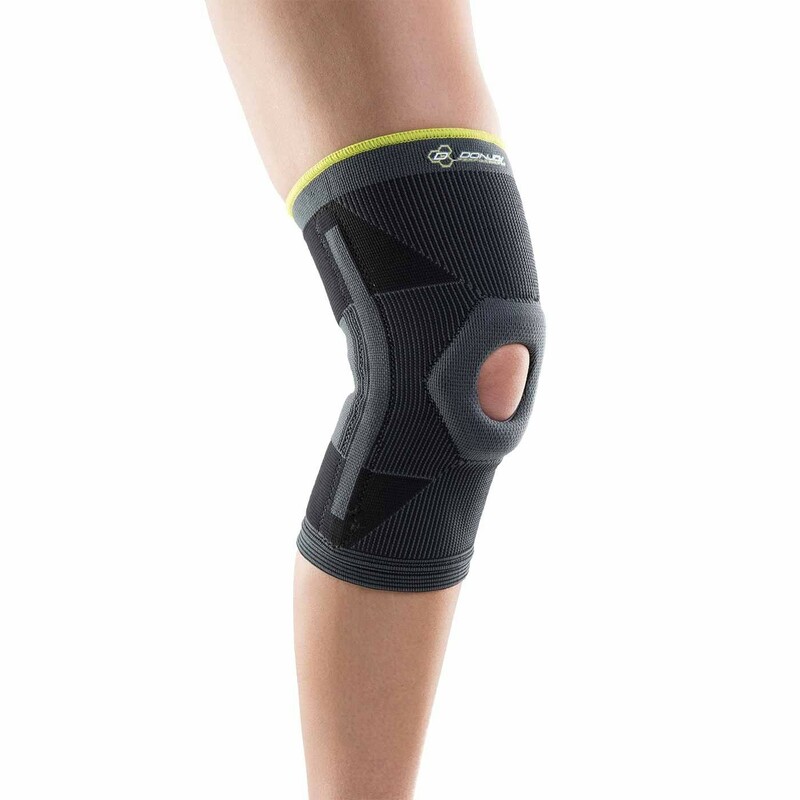 Designed as an open-patella knee support, the Deluxe Knit Knee With Stays features a silicone hex buttress to support and stabilize the kneecap while the flexible stays provide medial/lateral support without restricting movement. Constructed with 4-way stretch knit material, the Deluxe Knit Knee With Stays delivers plenty of flexibility, ventilation and comfort, whether you wear on or off the field. Slide sleeve up and over the knee, placing the knee cap within the patella buttress and the logo centered over the knee. The stays should fall on the inside and outside of the knee. Adjust as needed. To clean, hand wash in warm water using mild soap, rinse thoroughly and air dry. Size is based on the knee circumference, directly over the patella.